1st day: Champoussin  Aigle - Col des Mosses - Spiez  Aeschi = 139 km + 1717 m height-diff. On 26th July at 10 am. I said goodbye to my parents. When their auto went away next to me, I stayed alone far away from Hungary. On the first 10-20 km I managed to get used to the 24 kg pack, after it I thought I would have no problem with the climbs. The passroad up to the 1445 m high Col des Mosses was 20 km long. On the lower section I cycled fresh, so I could set the pace for a guy with a light racebike. On the asphalt of the upper part of the climb I saw the names of great Tour stars, like Armstrong, Pantani and Dufaux. 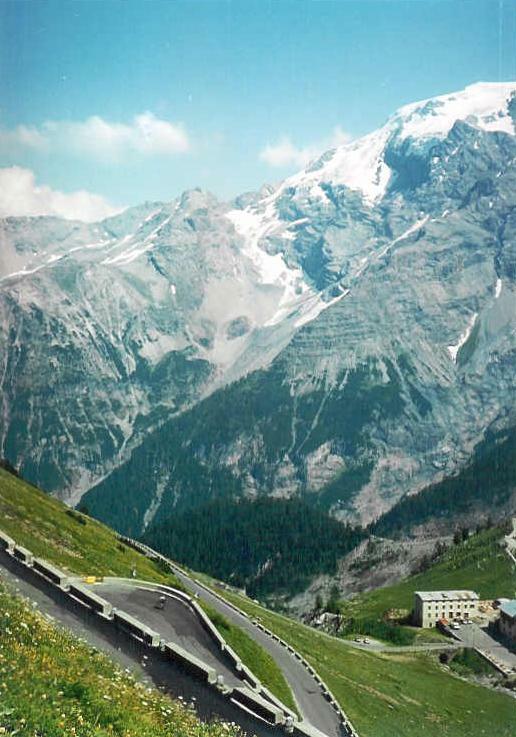 In the Tour de Swiss this year they probably cycled on the same road. From the friendly and not so rocky summit  which was rich in meadows - to the shore of the Lake Thuner I was rolling down through the kilometers of the not too wild county. I arrived at the side of the last big mountains of the Alps, so I couldnt see any snowy mountains towards north. 2nd day: Aeschi  Interlaken  Brünigpass  Luzern  Küssnacht  Altdorf = 159 km + 993 m height-diff. : The following day seemed to be a long one, like the day before. 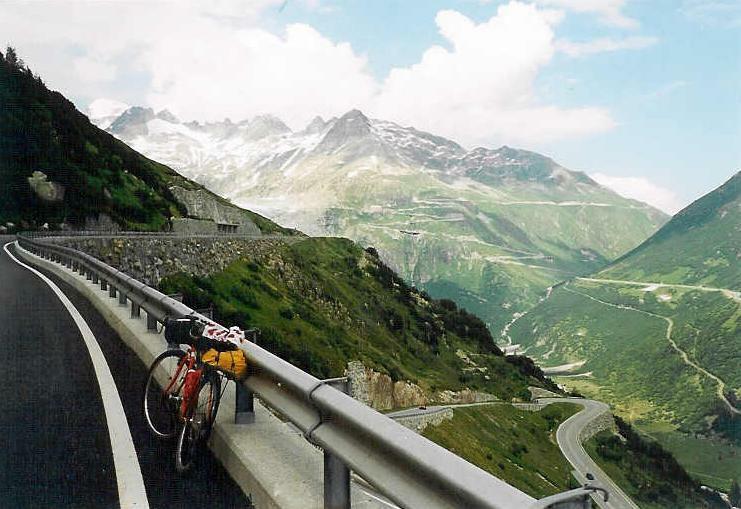 My goal was to cycle up to the three famous pass (Furka, Grimsel, Susten) on the third day, to be able to make this I should reach the 1440m high situated Andermatt on the second day. I should have cycled 170kms. I was pushing the pedals in a nice, sunny day along the Lake Thuner and Lake Brienzer that had clear water. Southward I could see high and snowy mountains. From Brienz enjoyed the view to the more than 3600m high Dammastock mountain, that I planned to bike around next day. The Brünigpass was only 1008m high, but I needed the last gear: 30*34. With this gear - despite of the big pack - I could push the pedals on the 10% steep ascent without any problems. From the summit there wasnt any view, but after 2 kms rolling I should stop at a parking place. There was a view of a bath-lake and the surrounding mountains. I arrived at Luzern after a long and gently sloping descent. I didnt have too much time, so I didnt went through the walking zones, but I took a look at the famous, flowered wooden-bridge, and the church next to it. It was good to cycle at that place I had been the first time with my parents in 1987, when I was only 11. It started rainig so I had to hurry with cycling away. From Brunnen I biked along the shore of the lake Vierwladstatter at the feet of the steep rocks. The cycleroad sometimes ran on the pavement, but elsewhere the cyclists were diverted into tunnels. The time was passing by, and I was a little bit tired of the 160kms I had biked that day, so at 18.30 pm, in Altdorf I decided to stop and to build up my tent. I postponed the last 35 km climbing to the following day. 3rd day: Altdorf  Andermatt  Furkapass  Gletsch  half of the Grimselpass  Gletsch  Furkapass  Andermatt = 105 km + 2939 m height-diff. In the sunny and clear weather the climb up to the 1440 m situated Andermatt wasnt a problem. But there was one thing I hadnt calculated with: on Saturday a lot of family started their holiday and sat into the car, so not only the highways, but my road was also full of them. 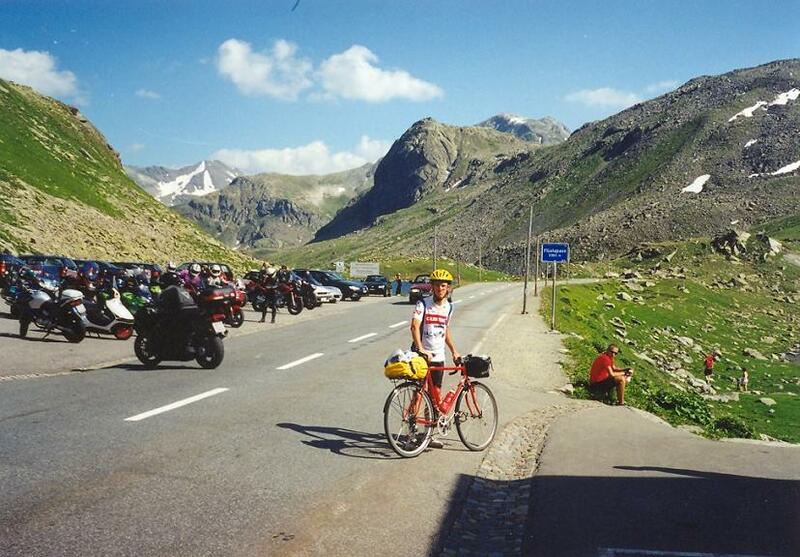 At the end of the village, Amsteg a table showed to the cyclists that to the Gotthardpass they had to climb 33km and 1600meters heightdifference. After leaving Wassen the road twisted between beautiful rocky mountains, later it went into half-tunnels which one side was tunnel, but the supports on the other side left views out from the tunnel. Because of the big traffic unfortunately I could hardly enjoy cycling. I had to watch the cars. I hadnt believed at home, that in Switzerland I would be fed up with the traffic. 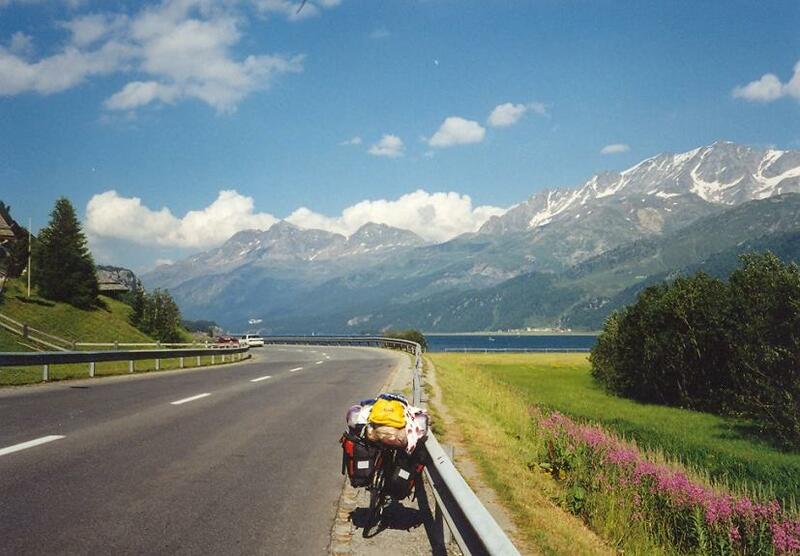 I was looking forward to the afternoon, when I liked to cycle on the calm and peaceful road to the Furkapass. In Andermatt I built up my tent fast, so after lunch I could start cycle up to the pass. At home from the website www.salite.ch I printed the diagram about the steepness of the Furka (and other) passroad, so I knew exactly the steepness for every kilometer. The climb was less beautiful than I thought; it was gone up on an uneventful ascent; there were not too many nice rocks or beautiful snowy mountains. After the efforts at the summit I got a fantastic scenery: 300m lower than me but 10 kms in front of me I could see the 2165m high Grimsel pass and two lakes beside it. Behind the pass there were a lot of snowy mountains, and some glaciers. I also could see the road down to the village Gletsch, down to the height of ca. 1750m and the road up to the Grimselpass. After rolling down I was pushing the pedals towards the Grimselpass when some clounds arrived, so it seemed to be better if I would turn back. Homewards from Gletsch to the Furka-summit I could bike with a very good speed. The threat of the rain gave me extra power. I had to hurry up if I wanted to avoid the cold rain and grey fog between the high mountains. Looking down back from the summit the Grimsel pass was covered by the moving-down clouds. 4th day: Andermatt  Oberalppass  Lukmanierpass  Biasca  Locarno = 148 km + 1520 m heightdifference In spite of the fact that I planned two high passes for that day I started my fourth morning calmly without any hurry. The 2044m high Oberalppass was the heighest point with my cycle with pack (without it I managed to cycle onto higher passes). 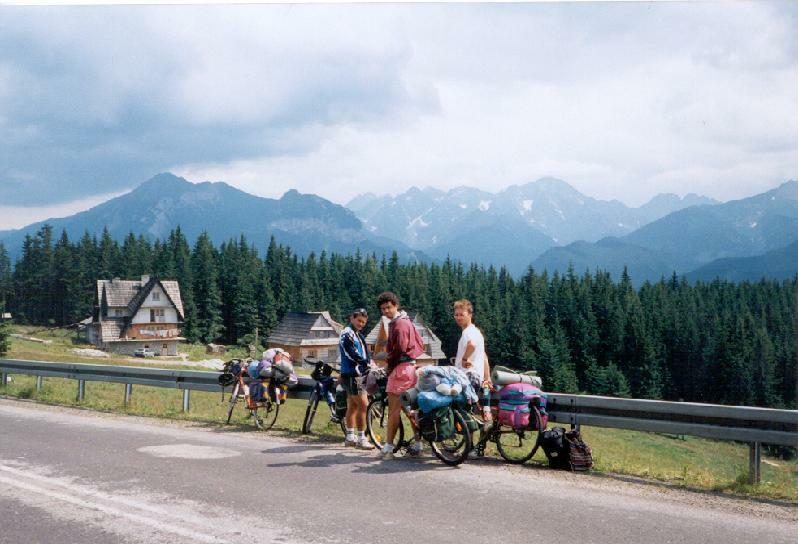 During my cycling carreer I hadnt biked so high with pack. On the climb there werent too many fir tree but there were beautiful views to Andermatt and the valley ended with the Furkapass-road. The red train on the green meadow which ascended up to the pass was a surprise. It seemed to be nice on the photo. I didnt enjoy the motordrivers, because of them the county couldnt remain calm and quiet. I like to cycle in a calm nature. On the plateau I reached the summit after cycling in a cold tunnel next to a 2-3 km long lake. The first part of the descent was full of sharp bends. 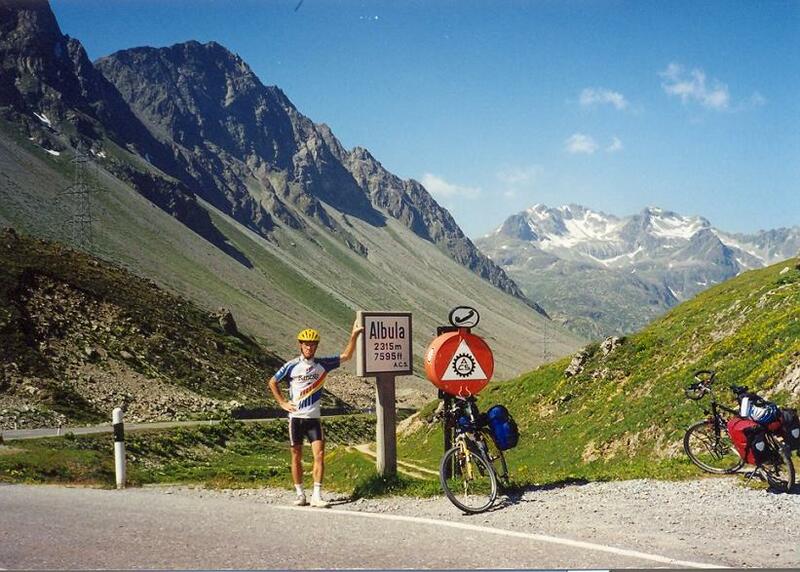 The climb up to the Lukmanier pass started at the height of 1143 m. The climb was 20 km long, but not too difficult. The lower part of the valley was nicer than the upper part. In the first few kilometers I pushed the pedals in a thin, and rocky canyon, later I cycled on meadows, and there were some beautiful scenery, but with not too much snowy mountains. In the last 5 km the valley was almost the same; it was bare and uneventful. I met a lot of motordrivers at this summit too. The first 5 km of the descent went through meadows with some trees, I saw some tourists walking. It was a good and nice area to make an excursion. Unfortunately the next 15 kms was not so good for my bike, because it was built from planes of concrete. I was rolling down carefully, with maximum 40-50 kms/h. The last ca. 20 km towards Biasca was gently sloping and I could cycle on a good road again. In the main valley of the Gotthard pass the nice pictures of the nature and mountains were damaged by industrial zones, factories and storehouses. While in the morning in Andermatt I read german letters on the tables, arriving into South-Switzerland almost every table was written in italian. I liked to spend my night in a camp on the shore of the Lago Maggiore, but I found there only full camps. At last I could build up my tent about 10 kms away from the lake, in Losone. 5th day: Locarno  Lugano (CH)  Menaggio (I)  Gravedona = 97 km + 674 m heightdifference I planned this day for cycling in the area of the Lago Maggiore and Lago di Lugano, thats why I didnt hurry and I left time for looking around, having a rest and time for regeneration. 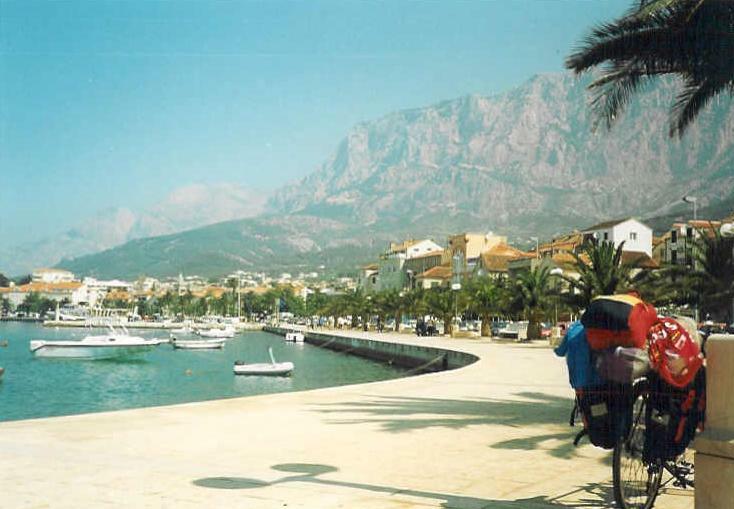 Locarno was an elegant, somewhere luxurious holiday-resort. In the morning I was cycling along the cycleroad next to the lake in a pleasant temperature. Palmtrees, evergreens and a lot of flowers enjoyed the sunshine everywhere. Unfortunately between the two lakes I couldnt bypass the big traffic. Sometimes in Switzerland I felt that the level of development is high and could be envied, but because of the too many cars cycling couldnt be enjoyed. 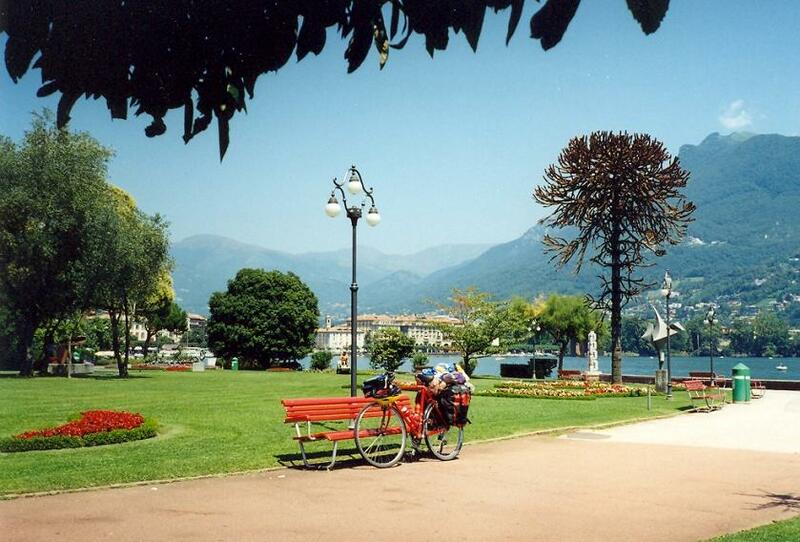 Like Locarno Lugano was a beautiful holiday-resort around with a lot of high mountains (photo). Sitting on a seat in the shore next to the palmtrees and flowers it was a good feeling looking around the lake. 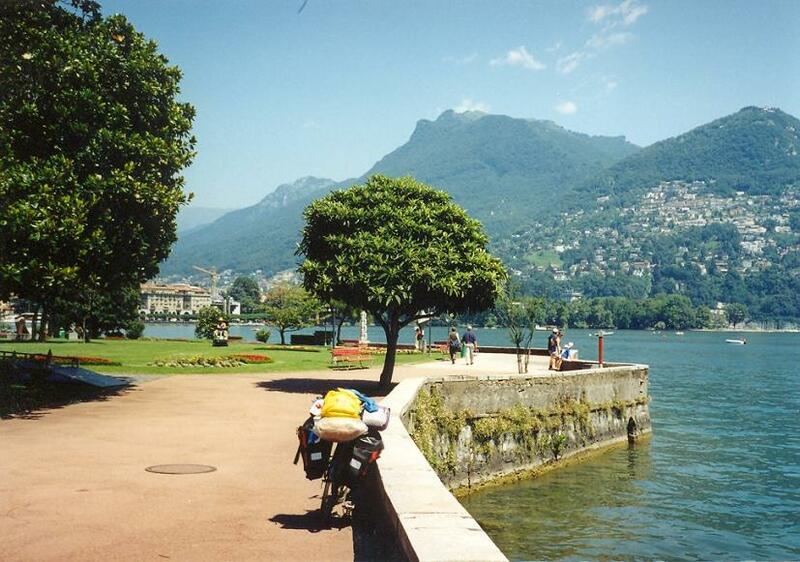 Arriving at Menaggio, in Italy I got sight of the Lake Como with a beautiful view. Behind the lake I could see 3000m high mountains. I spent the night in one of the last campings along the lake. Swimming in the 23-24 warm lake I not only enjoyed it, but I could take delight of the mountains around the lake. 6th day: Gravedona (I)  Chiavenna  Malojapass (CH)  St Moritz  Zuoz = 109 km + 1665 m heightdiff. I left the Lake Comó and two hours later Italy in a humid morning. The 33 km long climb up to the 1815m high situated swiss Malojapass started yet in Italy, in Chiavenna, at the height of 333m. With a pack on my cycle it was an ideal climb: the steepness in the first half was pleasant, only on a short section was 10% steep. In the last 5 kms the road went through a fir tree forest and the bends followed each other quicky. From one or two places I could see three hairpins downwards. In the air a helicopter was working: it flew up and down to carry away the felled trees. The other side of the pass descended very lightly (photo). Despite of the heavy wind I arrived at St Moritz in a short time. 7. nap: Zuoz  Albulapass  Davos  Flüelapass  Zuoz  Zernez  Nauders (A) = 188 km + 2412 m heightdifference I got up in a quiet camp for a sunny day, it was ideal for climbing passes. For my rest day I planned bicycling without the big back. Until afternoon I wanted to make a roundtour through the Albulapass and the Flüelapass, then in the everning I planned biking, rolling into Austria. The east side of the Albulapass was a 5-6 km long 8-9% steep climb. The road went through a fir tree forest but there were some good views to the Engadin valley. 2 kms before the summit - but already on the plateau - I competed with three swiss roadcyclists. They werent faster than me; I was happy. Towards Bergün the road was bad conditioned and somewhere bumpy. The section between Alvaneu and Davos was a good surprise for me: after the first 5-6 km serious climb the road was flat or ascended slightly. It was sad and interesting when in the summit  that could be ardly noticed because the light ascent and descent - the wind turned back. From Davos I started the 6-7% steep climb to the Flüela-pass in a fir tree forest with a good speed. In the upper region the area was bare, sometimes with grass, elsewhere with rocks. The lake, some snowspot and the green meadows made the summit beautiful. On a 10% steep descent I arrived Susch quickly. On the gently sloping road back to the camp I had to face with the wind, but after 20 minutes packing up this backwind helped me cycling back to Austria. I arrived the first austrian camp at 9 pm after hours biking, gently descending. 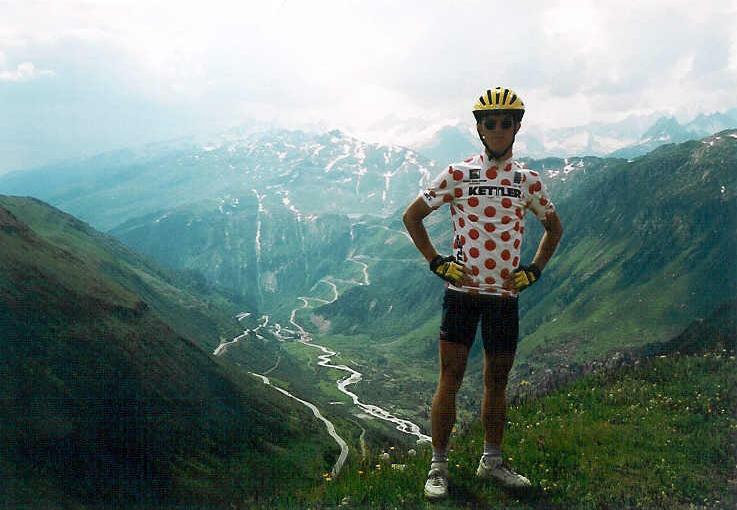 8th day: Nauders (A)  Reschenpass (I)  Prad  Passo dello Stelvio  Sta Maria (CH)  Reschenpass (I)  Nauders (A) = 147 km + 3008 m heightdifference In 2000 in the 7th Dreilander Radgiro Cyclemarathon I chose not to ride the longer distence and to miss the Passo di Stelvio because the cold weather and because after that I had to cycle back to home. I didnt want to get cold. 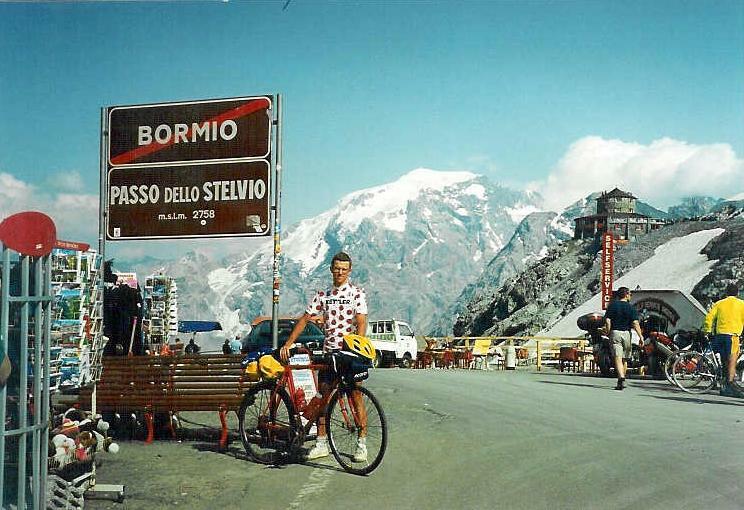 In 2001 it seemed that I could climb this famous pass and this ascent would be better than a year before because with riding not on a bikemarathon I have more time to take photos and videofilms. After leaving the camp the first summit I had to ascend was the 1504m high Reschenpass. I couldnt miss the strong wind, like a year before. From the italian village, Prad I had to climb 25 kms up to the 2760m high pass, the highest of Italy. Through this distance the 48 bends are numbered which give information to the cyclists about the heights. In the first few kilometers I was pushing te pedals on an average alpine road through a fir tree forest and along a stream. By the time I reached Trafoi next to the Ortler glacier and turned opposite to the pass I found the rythm. From there the 8-9% steepness was continuous. A lot of biker tried to climb this pass on that day, but I think for some of them it was ony one from the few trainings. I didnt compete but I took the hairpin-bends with a good pace. I found fantastic the mixture of the flowers, glacier, snow, blue sky and the green fir trees. I thought that it wasnt only one of the heighest pass of te Alps, but one of the most beautiful. I think that a lot of cyclist make a short break at the approximately 2000m high situated touristhouse, to get some water. (photo) I needed about two and a half hour to climb the passroad. At the summit there was a lot of tourists, souvenir-sellers, some shops. Westwards the view was disappointing for me, but towards east it was fantastic (photo). I could see a lot of bends where I had pushed the pedals. I could see the high mountains not from down but from the opposite. Despite the heights the weather was pleasant. Rolling down to Switzerland during some kilometers I could go only on landroad, but it was in a good condition. In 2000 some land went down from the mountain, and the road was damaged. The last pass of day was the Reschenpass again, which climbed surprisingly very well. I arrived at the camp at 8 pm. With this tour I finished the serious alpine climbs; in the last 2 days I had to roll down to Munich. 9th day: Nauders (A)  Landeck  Nassereith  Garmisch-Partenkirchen (D)  Murnau = 139 km + 658 m heightdifference I started descending towards Landeck under a little bit cloudy sky and in a close air. Because of the front that went through at night I couldnt sleep enough, so I was pushing the pedals tired and dully. After leaving Nassereith I climbed the 5 km long strong trafficked ascent of the 1216m high Fernpass in a good condition, maybe because of the threats of the rain and dark clouds. After only one kilometer descent I got a beautiful view to the area and the Zugspitze, which top was covered by clouds. In the valley the colour of the nice lake was green, blue and turquoise. After Lermoos the clouds flew down onto the mountains bordering the valley, so I hurried towards Garmish-Partenkirchen in the strong backwind with the speed of 36-40 kms/h. Despite that the town was fantastic with its painted houses, flowers, with the lot of tourists and with its mood I didnt have too much time to look around. The rain reached me, when I was bulding up my tent 35 kms towards Munich. I thanked for that it hadnt started before. 10th day: Murnau  Bichl  Wolfratshausen  München = 90 km + 220 m heightdifference After leaving the camp I saw fallen trees, broken down branches and some machines which tried to make cleanness again. Fortunately the rain ended about noon, and in the early afternoon I already cycled between or onto the small hills in sunshine. I arrived at Munich at 5 pm. At the main railway station I got the ticket for the bike, after then I was walking, cycling slowly and looking around in the center. I enjoyed that I could finish this fantastic tour. Travelling in the compartment of the 23.45 started train I didnt have any problem with the rain. After sleeping during Austria I arrived at Budapest at 9 am. The costs of the campings where I spent my nights were about 11-18 SFR. In South-Switzerland in the campings near to the shore of the lakes its difficult to find a place but I didnt have this problem between the mountains. Everywhere in Switzerland I could buy delicious bakers wares, its price was about 1-2 SFR. The food-shops are closed on Sunday, on this day we can buy in the shops of petrol-stations. 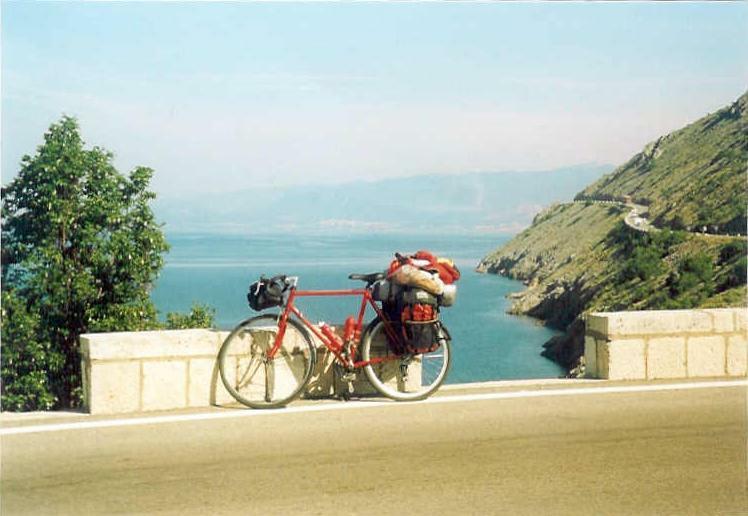 The quality of the roads (except a few pass-roads) are good, there are a lot of bicycleroad in the towns (eg. Luzern, Locarno, Lugano). There are roads which are more trafficked than I waited it.